Nina and Hans Heymann have operated The Oscar Swan Country Inn since 1988. Time has moved on but The Oscar Swan Country Inn, 1800 W. State St., Geneva, still revels in the treasured surprises of its unique elegance and rustic charm. Situated within the city limits of Geneva, the Inn is a short drive away from both the busy Randall Road corridor and downtown Geneva, where quaint shops and dining destinations await. But on this 8-acre setting, a former estate founded in 1836 is a quiet and unexpected escape. Nina and Hans Heymann have owned this property since 1985 and operated its mansion as an inn since 1988. The Heymanns first became interested in the property when they saw it listed in a real estate magazine. 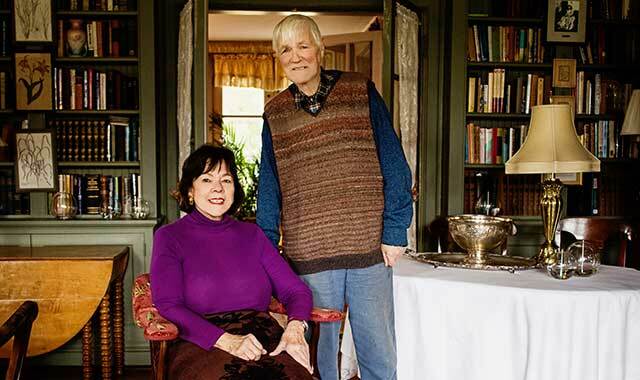 The vast amount of antiques in the home were intriguing to Nina, a former home economics teacher, and Hans, a former engineer at GE and a university professor of finance. The couple have poured their dedication and passion into warming the hearts of all who step through the doors. This cozy estate offers many gentle reminders of the past. See a corn crib, a preserved 1836 barn, and other farm buildings on a landscape filled with flowers, trees and the essence of nature. History presents a backdrop for gatherings and much-needed solace. Available for private getaways and social events, the Inn offers five scenic settings that host many a wedding reception and ceremony. There are several gardens, a pool and a walking path through still-untamed wilderness. The centerpiece of Oscar Swan Country Inn is a mansion that was built in 1902 by a Chicago banker named Oscar Swan. His family sold the estate in the late 1940s to businessman Frank W. Harding Jr., who came from a prominent American cattle-breeding family. He was chairman of a Geneva-based livestock import firm and insurance agency, and the founder of American Live Stock Insurance Co. The interior of the home still demonstrates many flourishes of opulence from the Swan family in the 1920s and the Harding family in the 1950s. The mansion’s seven bedrooms are adorned with rich elements such as rustic pine paneling, French Toile fabric ceilings, floral chandeliers and a secret passage. The private rooms are decorated with many authentic accents, and their private bathrooms feature pedestal sinks reminiscent of days gone by. The garden room sports a large gingko tree plant whose sturdy limbs and leaves meet in the center to form a heart. “I love coming into this room and seeing the tree envelop the sunlit windows,” says Nina. Antiques and nostalgic collections can be found throughout the mansion, creating a scenic backdrop for fun parties, elegant gatherings and other meaningful events. The Oscar Swan Country Inn has been a favored location for family reunions, birthdays, showers, anniversaries, memorials and retreats. “Guests have been very pleased with our nice food presentations and the fun of serving meals on our various mismatched place settings of patterned china,” says Nina. A full-service bar is available upon request. Not to be forgotten are the wide dessert selections, including customized wedding cakes and nontraditional centerpieces such as cupcakes, donuts or bundt cakes. While private social gatherings and overnight stays are staples at The Oscar Swan Country Inn, the general public is also invited to join special activities throughout the year. Lunches are hosted every Wednesday, and breakfast buffets are hosted Sundays at noon. A Valentine’s Day dinner is planned for Feb. 10. The menu includes beef tenderloin, roasted vegetables and comfort foods. Musical entertainment is provided by violinist Tony Marconi, who has played at Presidential inaugural balls and worked with Frank Sinatra, Tom Jones and Liza Minelli. He’s joined by Bill Robinson, a third-generation hammered dulcimer string player from St. Charles. Celebrate at the St. Patrick’s Day party and enjoy an Easter Sunday brunch, as well. Additionally, the Inn hosts the Country Inn Art School, where students create artwork inspired by their surroundings. Nina saves the personal letters she receives. They offer positive testimonials of time spent at the Inn. “Nothing makes us happier than having guests tell us how pleased they are that we exceeded their expectations,” she says. This entry was posted on Tuesday, January 29th, 2019 at 11:59 am	and is filed under Northwest Business Magazine. You can follow any responses to this entry through the RSS 2.0 feed. Both comments and pings are currently closed.